Richard Haining is a Brooklyn-based studio furniture maker and artist. Raised in Atlanta GA and educated at the Rhode Island School of Design, he is committed to responsible design that is elegantly hand-crafted with a modern sensibility. Influenced by the over-abundance of scrap wood being thrown out in local woodshops and from the plethora of pre-war building materials being trashed from NYC's architectural landscape, Haining salvages these “waste” materials to use as the building blocks for his STACKED Collection. The incredible variation and intensity of tones and colors inherently found in Richard’s STACKED work is a result of the wood's previous life; water and mineral stains, knots, century-old nail holes, and other “defects” that are part of that lumber's history, a fingerprint of time since passed, a natural beauty to be celebrated, and only found through reclamation. Inspired by the random appearance of old fieldstone walls along with the very precise and strategic manner in which they are constructed, Haining has adopted this process for his craft. He begins each piece with his vision, a full scale drawing, and a box containing thousands of consistently milled scraps cut to random lengths. Then, piece by piece, layer by layer, Richard builds each form hollow, all the while controlling the wall thickness and profile. The result is a terraced form which is then gently sculpted smooth using a variety of handheld tools…keep in mind, there is NO lathe work involved in any of his work. The one-of-a-kind patterns made by the tiny stacked wooden pieces achieve a quality reminiscent of basketry, ceramics, and mosaic tile work. The finely honed finished surfaces undulate ever so slightly under one’s hand, similar to that of hand built ceramics, inviting one to touch and take in the pleasure of the wood’s surface. 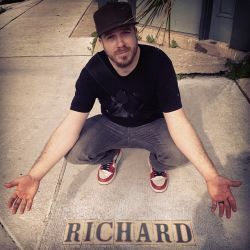 In a world that tends to covet newness and longs for instant gratification, Richard’s work finds value in the exact opposite. Whether it be a vessel, a sculpture, a table or a light, the ritual of creating unique objects from previously discarded materials makes a powerful statement about what we consider valuable and desirable. It is Richard’s hope that his work will inspire mindfulness and appreciation for materials often overlooked.